Kylie Jenner literally splurge millions of dollars to throw over the top party for her and Travis Scott’s daughter Stormi’s first birthday party. Stormi Webster turned 1 on Feb 01 and her parents hosted an extravagant party called “StormiWorld” at Universal Studios’ backyard. The little doting Stormi wore red sequinned frock and her makeup millionaire mom Kylie Jenner wore casual blue blazer at the birthday party. Due to extreme cold weathers, Kylie Jenner and Travis Scott postponed Stormi’s birthday celebration to February 9. Neertheless, the guest entered the “StormiWorld” theme party through Stormi’s giant featured open mouth. Upon entering, the guests were served with welcome drink, pretzels and mini pepperoni pizzas, where the drink glasses are embossed with StormiWorld written on it. The StormiWorld party also included merchandise named after Stormi for the kids takeaway. 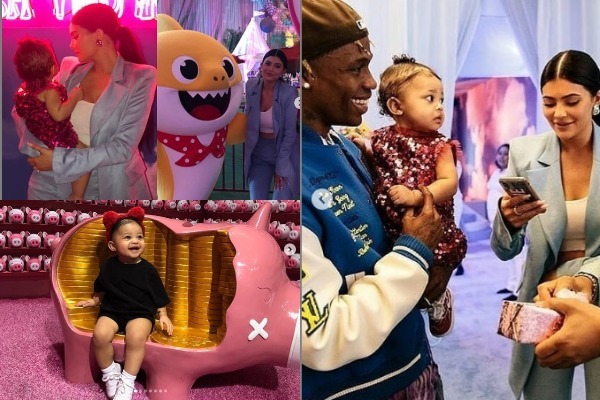 Carnival rides, the Butterfly Rainbow Forest, hot air balloons, rainbows and dancing pixies were also there at Stormi’s dream like birthday party. Possibly, Stormi couldn’t expect anything less than a CHANEL bag gift from DJ Khaled, which apparently is going viral on Twitter.